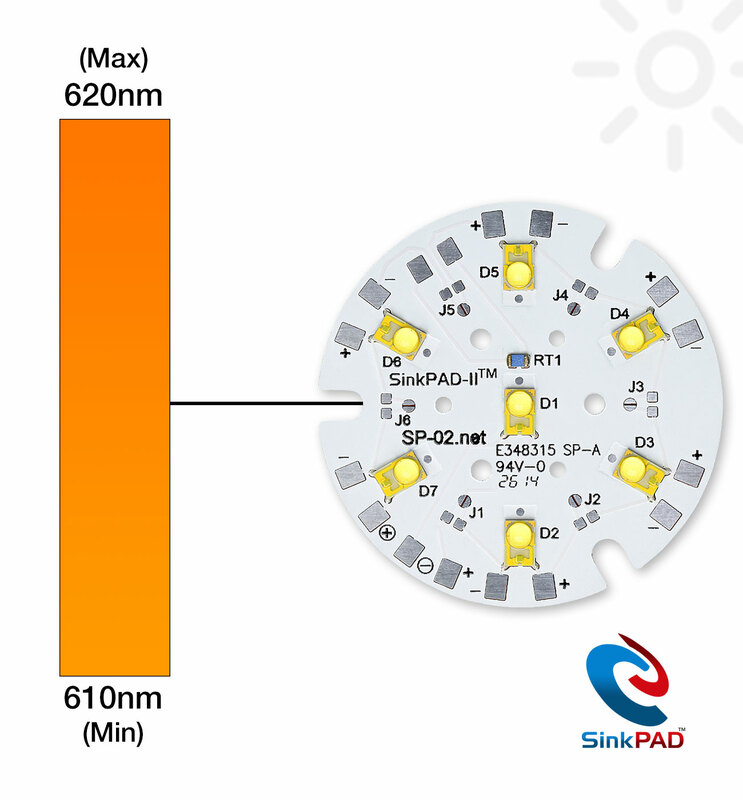 The SP-02-E6 LED module features 7 LXM5-PH01 Red-Orange, Rebel LEDs and NTC thermistor soldered to a SinkPAD-II™ 40mm Round base. A Vishay NTC 10K Thermistor (NTHS0805N02N1002J) is mounted to the board to monitor temperature and can be used for foldback temperature control. 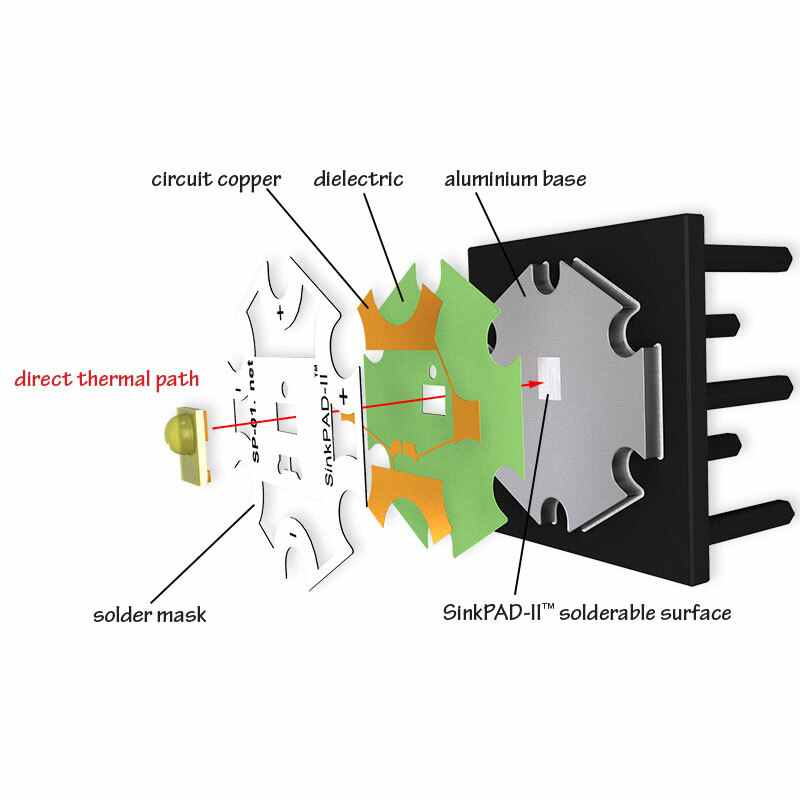 For more information about using the thermistor, please review our SP-02 Onboard Thermistor Temperature Measurement application note. SP-02-E6 LED modules must be operated to ensure that the junction temperature of the LEDs are kept well below the maximum ratings as specified in the LXM5-PH01 datasheet. A suitable finned heat sink or other cooling method must always be used when operating this module. The size of the heat sink will depend on the ambient temperature and the current that is used to power the LEDs. Bench testing that we have conducted with a SP-02-E6 module powered at 700mA in an open air environment and an ambient temperature of 25°C has indicated that a heat sink with a thermal rating of 9 C°/W or lower should be adequate. However, you will need to perform your own testing and analysis to determine if this size of heat sink will be suitable for your application. 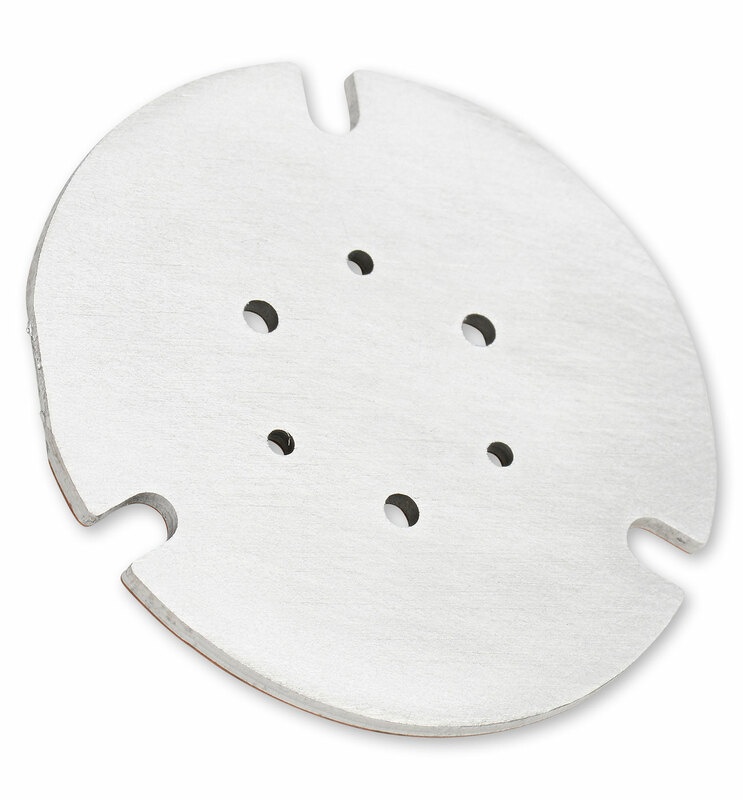 The SP-02-E6 must be fastened to the heat sink using a thermal interface material such as our pre-cut Bond-Ply 100 pressure sensitive, double sided thermal tape or Arctic Silver thermal adhesive. Before fastening the module to the heat sink, ensure that the two mating surfaces are perfectly flat and clean in order to maximize heat transfer to the the sink. The bottom of the module is electrically neutral, so it is not necessary to electrically isolate the base from the cooling surface. This LED module can be powered in parallel or in series with the addition of 0 ohm resistors or solder dots. Want to power this module from a voltage as low as 10VDC? Then check out the FlexBlock LED driver. 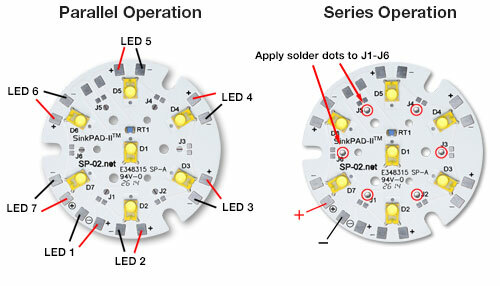 A single driver can power all 7 of these LEDs connected in series with any voltage from 10V to 18V*. * The maximum input voltage to the driver must be less than the total forward voltage of all series connected LEDs. Need a mixture of different color LEDs mounted to this board? 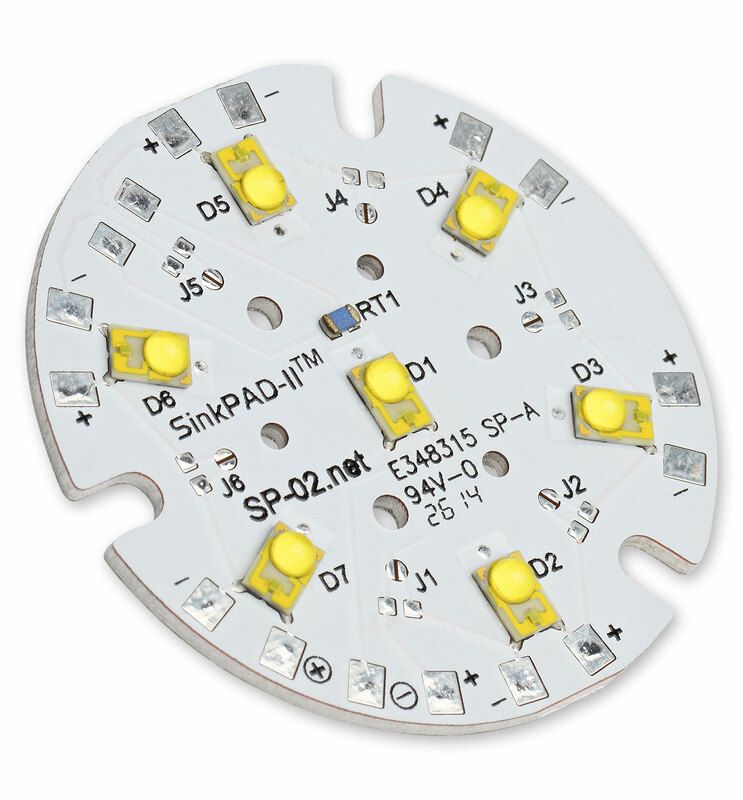 A color mixing version of this LED module is available. The SP-02-E6 can be ordered in any quantity with quantity discounts available.